Situated 430m (1,411 feet) above the Mediterranean, Èze (in my opinion) is the most picturesquely perched village in France, and if it’s not on your bucket list, it should be. This famous medieval village has been called an “eagle’s nest” due to its location. As you make your way from the base to the top, you ascend via a twisty, narrow cobblestone lane. You’ll pass stone buildings several stories high with heavy wooden doors, their shutters painted in muted shades of blue, ocher, and pink; the colors we associate with the South of France. There’s much to see; it’s easy to overlook a tiny shop or café. On this visit, I noticed a small terrace with a handful of tables tucked into an ancient stone wall. After glancing at the menu, I decided to have lunch here; I’m so glad I did, my meal was delicious. Menu: Although the restaurant is small, the menu is extensive. Portions are generous, come hungry. There’s a nice selection of salads including La Chèvre made from heaping helpings of tomato, cucumber, hot goat cheese, and olives on a bed of baby greens. Dressed with provencal olive oil and Paprika vinegar, and accompanied by a basket of fresh bread, it will quiet those hunger pangs. Of course, you’ll find a variety of platters including a classic cheese and charcuterie platter. Designed for two, they’re served with a variety of olive oils, vinegars, fresh bread, and salad. Pizzas, lasagna, sandwiches, and desserts round out the menu along with an impressive beverage list. All wines come from Provence. Thoughts: I heard the music (from the 70’s) before I spotted the cozy terrace. I immediately knew this was the perfect spot for lunch. The lone waiter smiled and quickly whisked me to a table under a shady tree. After taking my drink order, he returned with a dish of olives marinated in basil infused olive oil, and a carafe of water. The presentation was simple and elegant; the olives delicious. I was starving but didn’t want a heavy meal that would weigh me down as I continued my uphill walk to the Jardin Exotique. I finally decided on the Pan Bagnat sandwich and a glass of white wine. 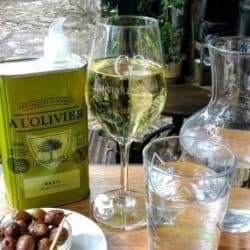 Sipping my wine, I noticed an olive oil tasting area in front of a tiny shop which sold tins and bottles of A L’Olivier olive oils as well as vinegars. How did I miss the Deli and its shop before? Noticing the worldwide shipping sign, I was pretty sure I’d be taking advantage of that offer after lunch. I was surprised when the waiter placed the sandwich before me. It was much larger than I anticipated; no dessert for me if I wanted to reach the summit. Made from a lightly toasted, crusty loaf of round bread, and smothered with tuna, baby greens, slivers of radish and onion, diced yellow pepper and anchovies, and slices of tomato, it was healthy and a specialty of the South of France. A generous lashing of Garlic and Thyme olive oil and Balsamic vinegar provided the ideal dressing. The Pan Bagnat was delicious and filling, and I finished every bite. The price was fantastic, especially considering the quality, and quantity of the food. My sandwich was 10€, the glass of Verre Crostes Blanc was 7€. For a total of 17€, I ate like a queen. Note: If you’re in need of an authentic souvenir, look no further than the olive oil shop. 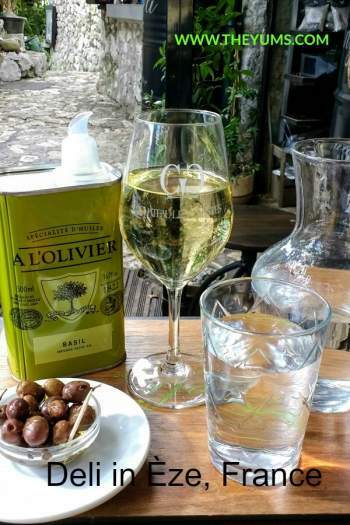 The beautifully packaged A L’ Olivier olive oils are delish and highly prized. Any foodie would relish a tin or two. Price Range: Salads are 14€-16, platters run 15€-28. Pizzas are 10€-11, while lasagna with salad is 17€-18. Sandwiches range from 7€-10, and desserts are 7€-10. A glass of wine is a reasonable 7€-12.